No matter what country you live in you are generally affected by the politics in that country. Sometimes you are free to vote for the people who are elected into positions of government, such as in the United States of America. Sometimes you are pleased with the results of the election and other times you are at the mercy of the government because the majority elected and official that you chose not to elect or someone was appointed into a position of authority that clearly is a detriment to the population. Regardless of the outcome, voting and the political process is continual in most countries. 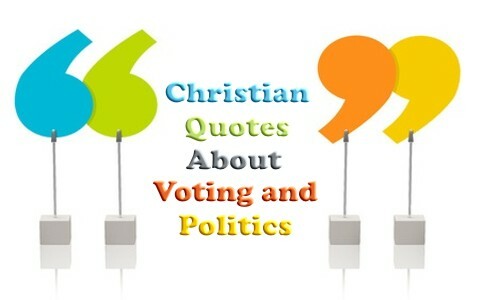 Here are 20 Christian quotes about voting and politics. Voting and politics are sometimes avoidable, but why not use your voice to make your country better. As Christians we are told to pray for our leaders and to submit to their authority. Elections of government leaders is found in the Bible and we can even see that the “king’s heart is in the hand of the Lord”. Consider how you can make a difference by participating in the process to get good government leaders in place. Thanks for the tips on voting my country will benefit from this. Previous post: What Is The 3rd (Third) Commandment In The Bible?